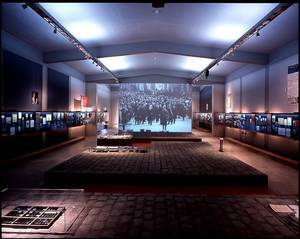 A condensed version of the special exhibition about the Oranienburg Concentration Camp which was shown in 1994 was included in the permanent exhibition in the “New Museum”; an exhibition which was opened in 2002 and deals with this history. The Oranienburg Concentration Camp was located just three kilometres away from today’s Sachsenhausen Memorial Site. The local SA elite guard regiment set up this camp in a former brewery right in the centre of Oranienburg on March 21, 1933, three years before the building of the Sachsenhausen Concentration Camp. Interestingly, March 21, 1933 was the “Day of Potsdam”, a day on which Germany’s conservative elites paid homage to Hitler. It is still often confused with the Sachsenhausen Concentration Camp which was built by prisoners in 1936. Using the example of the first early Oranienburg concentration camp, the exhibition at this memorial site is designed to remember the beginnings of the system of terror during the time of National Socialism. The impressive exhibits document the rapid transition from street terror to a government-run concentration camp system. As the exhibition will demonstrate, the first concentration camps in Germany were, above all, local “revenge camps”, in which the National Socialists could imprison their political and intellectual opponents from the Weimar Republic’s street battles and wars of words, in order to set an example. Perpetrators and victims often came from the same social circles or were neighbours or family members, as was the case in the Oranienburg Concentration Camp where the communist Willi Ruf was confronted with his father who was an SA guard (SA is an abbreviation for Sturmabteilung, which was a Nazi paramilitary organisation). Up until the disempowerment of the SA in the “Night of the Long Knives” or “Röhm-Putsch” and the closing of the camp in July 1934 by the SS, around a total of 3,000 prisoners out of Berlin, Oranienburg and the surrounding area were imprisoned, humiliated and abused in Oranienburg, the first concentration camp in Prussia. At least 16 prisoners died, among them the writer Erich Mühsam. One of the focuses of the exhibition, besides the life paths of individual prisoners of different political shades and social origins, is the biographies of the perpetrators, and above all those of the Oranienburg SA. Another topic of interest is how the public dealt with the camp, especially considering its central position, located not far from the castle on the lively Berliner Straße and its close integration into city life. For example, the camp was used to photograph set-up scenes of camp life for propaganda purposes in and out of Germany. One of the things shown was a weekly report about the Oranienburg Concentration Camp which depicted a sugar-coated image of “re-education” achieved through exercise and hard work. Torture and murder weren’t shown in this report. Finally Gerhart Seger, a Social Democrat who was able to escape at the end of 1933, reported on the situation in his book, “Oranienburg. The first authentic report from someone who escaped the concentration camp”. The book was published as early as 1934 and contributed to the Oranienburg Concentration Camp becoming a worldwide symbol of Nazi terror. In the exhibition designed by Stefan Haslbeck, a multitude of outstanding exhibits line the walls of the exhibition spaces in end-to-end display cases. Among the objects to be seen are drawings by the Austrian painter Rudolph Karl von Ripper, who finished his paintings after his release from the Oranienburg Concentration Camp, as well as widely unknown works by George Grosz about Erich Mühsam’s feigned suicide, or pictures, documents and personal effects from the estates of SPD politicians Ernst Heilmann, Franz Künstler, Otto Scharfschwerdt and Friedrich Ebert the younger, as well as Alfred Braun and Hans Flesch, both Berlin radio personalities, the author Armin T. Wegener, Ehm Welk and Erich Mühsam and lastly Kurt Hintze, Willi Ruf and Wilhelm Schulz, all Oranienburg delegates. However, the overall concept of the exhibition is based on the use of the original stones from the former brewery’s courtyard. They are laid out through the middle of the exhibition like a street and largely determine the impression you get when you walk into the room as well as the general character of the exhibition.